You probably missed the obituary. But on July 7, when North Korean media announced the death of the 88-year-old senior North Korean official Jon Pyong Ho, it highlighted an important but largely ignored development in Pyongyang’s effort to build weapons of mass destruction (WMD). While most observers focus on Pyongyang’s nuclear and missile tests, they ignore the shift happening in North Korea’s WMD community: a newer generation is replacing the North Korean scientists who played a key role in developing Pyongyang’s WMDs. This new generation will play a central role in determining whether North Korea will become a (small) nuclear power. Generational change is natural as older scientists fade from the scene, but there are other factors driving this process. North Korean munitions production formerly focused on enhancing conventional military capabilities, developing short and medium-range ballistic missiles, and filling orders from foreign countries. But by the mid-1990s, resources had already begun to shift to the development of long-range missiles—like the Taepodong rocket, which first launched in 1998. The emphasis on nuclear weapons and missile delivery systems as the bedrock of security policy accelerated after the 2002 collapse of the 1994 denuclearization agreement between the United States and North Korea. From 2006-2013, North Korea tested both nuclear weapons and the long-range missile technology that could be used to deliver them.In March 2013, North Korea codified these priorities by adopting “a new strategic line on carrying out economic construction and building nuclear armed forces simultaneously” during an important party meeting. This emphasis resulted in a reorganization intended to reinforce the ruling Workers’ Party of Korea’s control of all WMD and space-related activities, previously spread across a number of organizations, and now probably consolidated under one group, known as the Machine Building Industry Department (MBID). This restructuring and transitional shift first became evident in September 2010 when Jon, who at that time was 84 years old and had served as the party official in charge of the munitions industries for 23 years, was promoted to a more general government post. At the same time, his old job was split between the 70-year old Pak To Chun and the octogenarian Ju Kyu Chang, who became department director and subsequently entered semi-retirement. That may not seem like a big change, but in the world of top North Korean officials, many hang on to their posts until their 80s. While generational change began during Kim Jong Il’s last years as ruler, his son and successor Kim Jong Un, who took power in December 2011 following the death of his father, may have further encouraged this process. 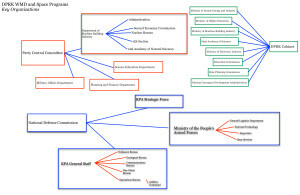 Unlike his father—who appeared to prefer small working groups of top officials and middle managers to deal with WMD issues—Kim Jong Un convenes meetings with experts at both the executive and working levels.The process—more open and involving a higher number of participants—gives him direct contact with working-level personnel and allows them to develop personal links to the supreme leadership that would not have been possible before. Kim’s style probably creates new avenues of advancement for younger scientists and technicians although it’s unclear whether this new method will give the WMD community more clout. North Korea’s plans to develop new nuclear weapons designs, produce more fissile materials for a larger stockpile, and launch bigger and better rockets will depend largely on the capabilities of its next generation of WMD scientists and technicians. Jo Chun Ryong: A former factory manager and party official in the arms production industry in his 50s, Jo has worked on developing the North’s new multiple launch rocket systems and intermediate-range ballistic missiles. In early 2014, he was appointed department director of the MBID as well as chairman of the Second Economic Committee, which manages the North’s network of munitions factories and production sites. He appears to be responsible for the daily operational management of the North’s military industrial complex. Around the same time, he was elected to the National Defense Commission, the state’s most important decision-making body. Despite being probably the second-most powerful official in the WMD community, Jo has made few public appearances. Hong Sung Mu: The party’s key manager of WMD and space programs, Hong is a deputy director of the MBID in his early 60s who has served as Pak’s number two man since 2010. Hong probably played a key role in supervising the February 2013 nuclear test, and he has appeared in North Korean state media attending events related to a successful December 2012 rocket launch, as well as the 2013 nuclear test. Hong Yong Chil: Another MBID deputy director, Hong appears to be a close advisor to Kim Jong Un on machine-building technologies and arms production—he routinely appears at missile tests and machine factories alongside Kim. In June 2013, he reportedly attended Kim’s tour of the Kanggye Tractor Plant in the northwestern Jagang Province—which may house equipment involved in the production of uranium enrichment centrifuges. 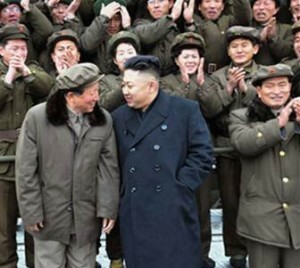 Hong appears regularly in North Korean state media, and is one of the public faces of the WMD community. While these officials are the more visible faces of generational change in North Korea’s WMD establishment, that change is also taking place among the hundreds if not thousands of scientists, technicians, and workers who work for them. Because patronage is prevalent in North Korean politics, the rise of new senior officials has brought with it a network of younger scientists and technicians. Moreover, graduate or doctoral students who assisted in research for North Korea’s first nuclear test in 2006 have since then most likely enjoyed career advancement. Similarly, a low-level technician or graduate student who participated in the 1998 launch of the Taepodong-1 rocket may now be a mid-level manager in the ballistic missile or space programs. Pyongyang has been careful not to expose individuals to public scrutiny, but observers can glimpse the new generation through North Korean media. Kim Jong Il posed for photographs with scientists and technicians involved in the 2009 Unha space launch vehicle test. 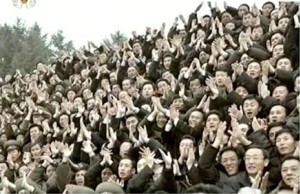 They appear to be closer in age to members of Kim Jong Un’s generation, or roughly half as old as the department heads in the front row. In 2012, after another space launch vehicle test, North Korean media announced a list of recipients of titles and awards. The largest number of those recepients mentioned by name were the 27 winners of the Kim Jong Il Youth Honor Prize, awarded to individuals under 30. As for the nuclear weapons program, a commemorative photo with personnel involved in the February 2013 nuclear test shows technicians and experts who appear to range in age from their 20s to 40s. Generational change also extends to North Korea’s nuclear reactor program. According to the North Koreans, experts in their 40s designed the country’s new experimental light water reactor, probably intended to produce energy for the civilian sector. Individuals who worked on a similar reactor program established under the 1994 agreement but never finished appear not to be involved; older engineers at the Yongbyon nuclear installation, where North Korea builds its nuclear weapons, appear not to be involved either. But the new generation will play a large role in determining whether North Korea possesses the capability to launch rockets that can reach the United States. This article was co-published with Foreign Policy on September 22, 2014 as “Meet Kim Jong Un’s New Nuclear Warriors: What a new generation of scientists and apparatchiks mean for North Korea’s nuclear program.” The article may be accessed here: http://www.foreignpolicy.com/articles/2014/09/22/north_korea_kim_jong_un_weapons_of_mass_destruction_younger_generation.